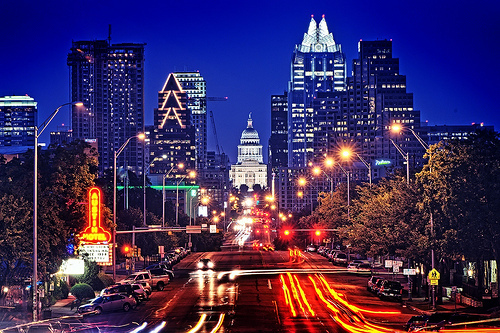 Austin, Tex., is one of the cities that has benefited from IBM's Smarter Cities initiative. Photo by John Rogers. Congestion pricing to reduce traffic and pollution; water systems that automatically detect leaks in pipelines and notify authorities; food that is tracked from farms to supermarkets to ensure food safety. These are some of the recent technological advances that are improving sustainability and quality of life in cities. Through its Smarter Cities Challenge, a three-year, $50 million initiative to provide technology and services to 100 cities around the world, IBM aims to help cities address their most pressing problems, from health care to education to mobility. The Challenge is currently accepting applications from mayors who make a case for how their cities can benefit from IBM’s expertise in smart systems. This year’s deadline to apply is December 31. According to IBM’s Corporate Citizenship Director Jennifer Crozier, the company is focusing on cities because they represent the convergence of multiple systems: transportation, sanitation, health care, education, public safety, and many others. Cities are also where the most resources are concentrated, making them centers of innovation, human capital and sustainability, points out Brookings Institution Senior Fellow Robert Puentes. As an organization that specializes in systems thinking, Crozier says that IBM enjoys working where one system interacts with another and “things get messy.” Recognizing that urban solutions would benefit from integration, IBM intends to dispatch teams of experts to engage city governments, collect and analyze data, and introduce next-generation technology in cities selected to take part in the Smarter Cities Challenge. Take, for example, a road. Instrumenting the road with cameras and sensors can tell us information about traffic flows and how fast it is moving; connecting this information to city governance allows quicker response to traffic incidents; and layering data analysis onto that can help planners determine which areas of the city are most prone to road traffic collisions, leading to improved public safety. Data analytics is the core value that IBM provides to cities. Crozier points out that “planners need the ability to see data in real-time and visualize it meaningfully in order to deliver services.” Decision-making is further enhanced by the ability to use predictive modeling to determine future scenarios, such as in Chicago, where computer software allows various stakeholders in the urban planning process to simulate the consequences of different policy choices 40 years ahead. There are many other examples of this type of technology-based planning, used for different purposes. The city of Baltimore uses data to improve the well-being of the city’s children. And as we’ve written about before, Washington, D.C. uses data for long-term Metro planning, providing a good case study of how technology is improving mobility. What we’ve learned over the last couple of years is that cities get the concept of using technology but see it as unreachable: their tax base is falling, more and more citizens are unemployed, and they are struggling to deliver services with diminishing resources…[IBM provides them] the ability to take a breath and think strategically about what kinds of things are possible today that weren’t a few years ago, and how they can help them deliver solutions to their cities. Smarter Planet gifts the cities with knowledge about what is possible with technology and what is happening in the private sector. The keys to a successful public-private partnership, according to Crozier, are access to and time with senior city leaders. The reason IBM’s pilot projects in Baltimore, Md., and Austin, Tex., have succeeded is that city leadership, including local government officials, business leaders and non-profit professionals, have been candid about their cities’ priorities and are willing to share their data and work together. Sometimes making a city smarter involves solving problems that are not directly related to technology. The city of Austin asked IBM to suggest ways to address the economic disparities between its east and west sides, a division symbolized by highway I-35, which bisects the city. East Austin was one of the case studies examined in a 2006 report on concentrated poverty in America. The resulting recommendations involved changes in marketing, infrastructure and social service delivery, among others. The Smarter Cities Challenge looks to solve a diversity of problems in both developed and developing cities. The winning cities will be those that can articulate a few strategic priorities that need to be addressed, and those that have track records of innovative problem-solving and a willingness to use technology. Encourage your leaders to apply today to make your city a smarter, better place to live. How would you use technology to improve your city?